Welcome back after Christmas. The New Year in class 3 begins with lots of exciting learning and fun activities. We will continue our visits and relationships with our pen pals at Boroughbridge Manor Care Home and we are looking forward to visiting Allerton Waste Recovery Park to learn about environmental issues. Please click on the links below to see what we are learning about in theme, what the weekly timetable looks like and what homework will be on offer for the spring half term. Class 3 would like to say a big thank you to everyone at Boroughbridge Manor Nursing Home who made us feel very welcome last Friday. We had a lovely time celebrating Christmas, by singing carols and playing games. We were also a little sad too because it was Rose's last day and she has helped us and supported us a lot over the last two years. We would like to wish her all the best for her new venture in the south of England. We are looking forward to working with Suzanne in the New Year. 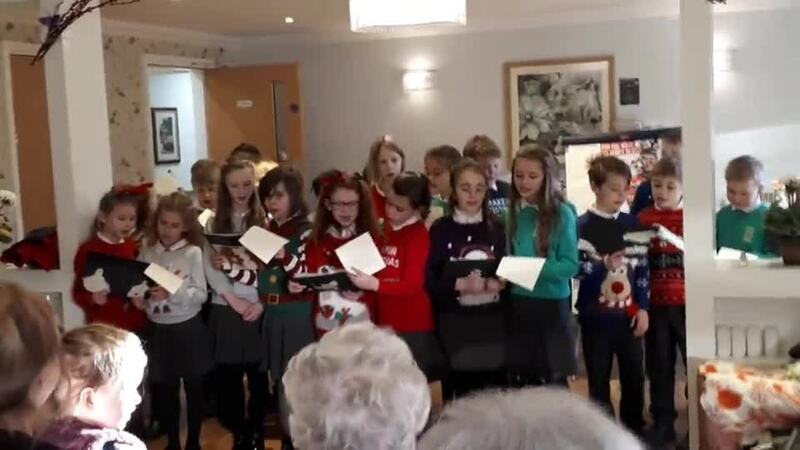 Take a look at the pictures below to see how Class 3 and the residents got all 'christmassy'. Class 3 had a wonderful time at the nursing home celebrating Armistice Day. It was lovely to see the children asking questions and so nice to hear the residents telling stories about their time during the war. Please find an updated homework grid here and the new theme grid here for the second half of Autumn term. Class 3 had a lovely time at Harrogate Museum where they furthered their knowledge about the Stone Age and learnt new things about Art. The children enjoyed discussing their views about artists and their work. After a spot of lunch the children were invited to take part in an exploration activity where they held Stone Age artefacts and showed off their existing knowledge about the Neolithic period. Connie deciding if she likes the artwork. We had to persuade the rest of the class which was the best piece of artwork and why. Class 3 restart their project at Boroughbridge Manor nursing home. It was a lovely experience for everyone. We made pitta bread and then wrote instructions. We have been using place value counters in maths. We enjoyed eating Beatrice's Stone Henge! Welcome back everyone after a lovely summer. Class 3 have lots of exciting learning taking place this half term. We plan to make stone age oatcakes, continue our fortnightly visits to the local nursing home and take part in lots of engaging and hands on lessons in maths. Please feel free to pop in at any time to take a peek at our vibrant and colourful classroom. If you have any questions or queries then please don't hesitate to see me- our classroom door is always open. In the meantime, take a look at the most recent homework grid here, theme grid here and an updated weekly timetable here.